Hierogrid is an interesting game/puzzle. Your man will travel along the grid in all directions gobbling up tiles. 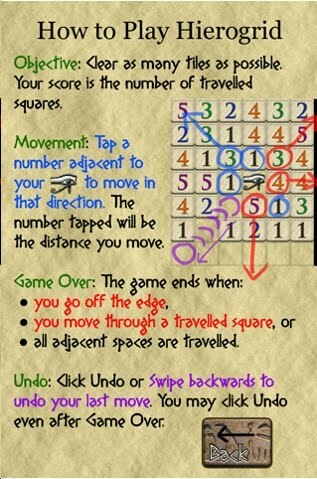 Step on a 4 tile and travel in that direction 4 times. The game ends when your man falls off the grid. Hierogrid is fun and there is a free version. I have not downloaded the full version, but I'm guessing that the user can replay a specific game and challenge yourself to get a higher score. Make It So Studios made this. Go ahead and give it a try! The Wall Street Journal on Saturday had a nice article on my magic/puzzle friend Mark Setteducati. 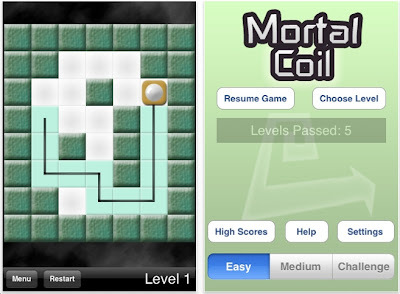 When I first started playing Mortal Coil, practically nobody had played it. I started my quest to solve all 400 levels. A daunting task. A couple of days ago, I was #10 on the Leaderboard. Then suddenly.....I was #11. Somebody named Addjoe raced past me. But I caught up. Yesterday, he & I were neck and neck for about 2 hours. I decided to let him take the lead again - after all, I had to eat dinner. Oh, right behind us is somebody named Cookie. And Prof Tangram is about 40 puzzles ahead of us. If I were betting $, I'd say he'll get to 400 first. 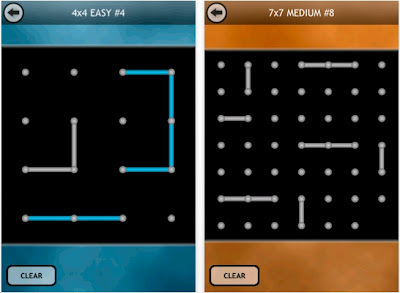 I'm not sure if I have the patience to solve all 400 levels. There are other types of puzzles to solve of course. Here's the Leaderboard. Feel free to bookmark it to see my progress. Christophe Burckbuchler is one of many people who have taken the concept of Rush Hour by Nob Yoshigahara and Harry Nelson to make their own puzzles. What's most disturbing is that the grid sized is always 6x6 with the car being in the third row from the top. 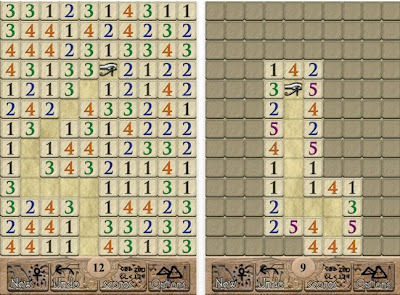 Puzzle imitators: there is a question of ethics regarding whether one should imitate puzzles so closely. Please make a variation! How about a 7x7 grid? How about using a forklift that can shift a car in a parallel direction? 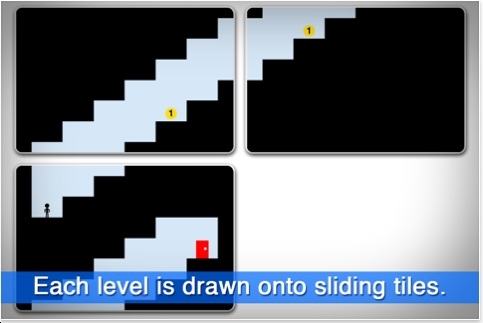 The object of Pipe Pressure: rotate individual tiles so the light source reaches the target number. We've seen many of these types of puzzles before, but this one requires that the objective be met within a certain number of moves. 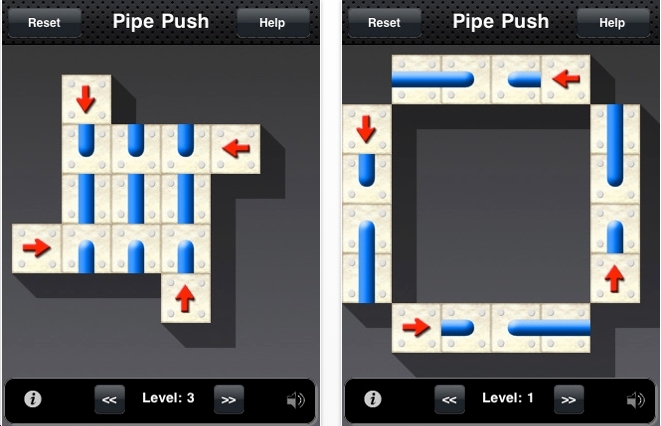 Usually pipe puzzles require all the pipes to be connected - not this game. It's free to download! Benjamin Tang created Pipe Pressure in his spare time. Continuity 2 is the sequel to the original game published about 2 years ago. That original game could only be played online. Truly fabulous. The object is to get your man to pick up a key and then to a door. Slide your man within each frame. Zoom out to rearrange the order of each frame. 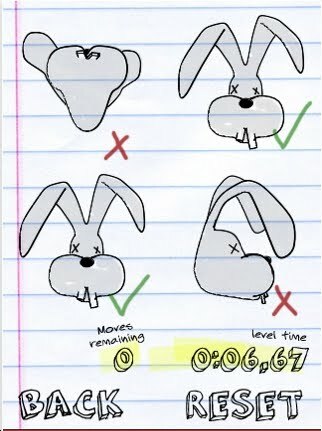 Continuity 2 has all new levels. You absolutely must download this. Ragtime Games consists of Elias Holmlid, Dmitri Kurteanu, Guy Lima Jr., and Stefan Mikaelsson. They reside in Gothenburg, Sweden and study at Chalmers University of Technology and Gothenburg University. This team produced a fun, great, simple, puzzle app. Read my blog entry for January 4, 2010 when I reviewed the original game. 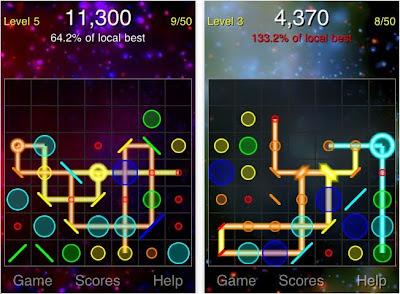 Mazzle is similar to other puzzle apps. The object is to arrange all the colors into squares. This is done by shifting rows & columns. There are 3 levels. The image above shows the medium & hard levels. 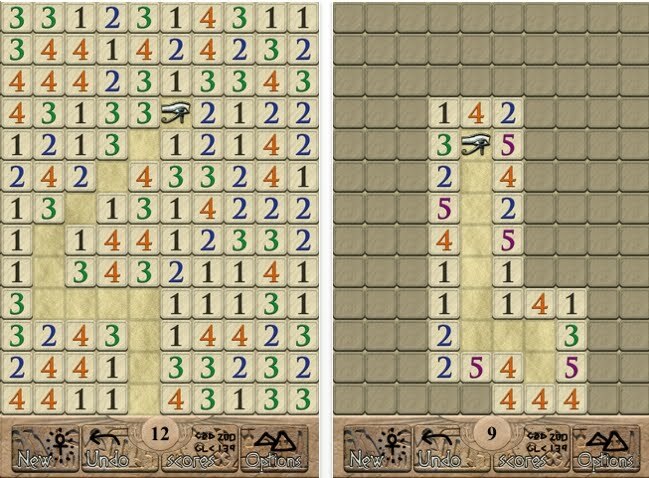 Notice that each square is unique, so this is harder than the other versions. Question: is it possible to exchange to adjacent squares? The object is to shift rows and columns so that the lines have proper end points. 9 levels. Not too hard. I spent maybe 15 minutes on this. It's free. Wang Yujin created this puzzle app. 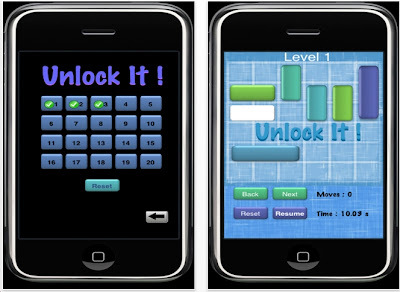 I reviewed another of his puzzle apps called Untangle. Binary Sudoku: the concept has been around for a while. Each grid uses only 0's & 1's. Each row & column must have an equal # of 0's & 1's. No row can be exactly the same as another row. Ditto for columns. 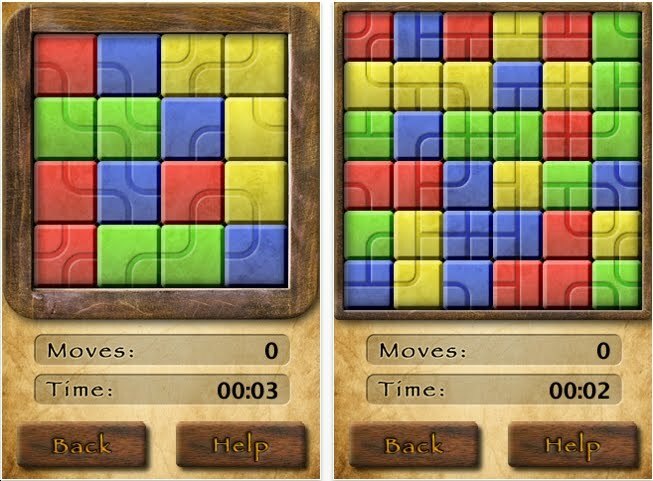 The free version has 15 puzzles. The paid version has 100 puzzles. 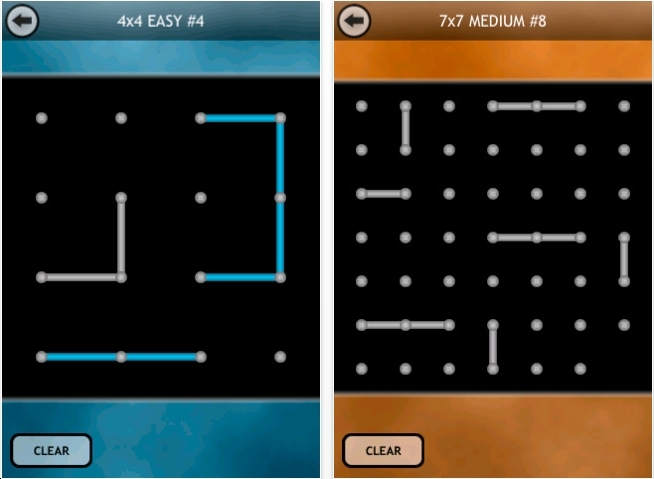 I did 1 easy, 1 medium & 1 hard levels. 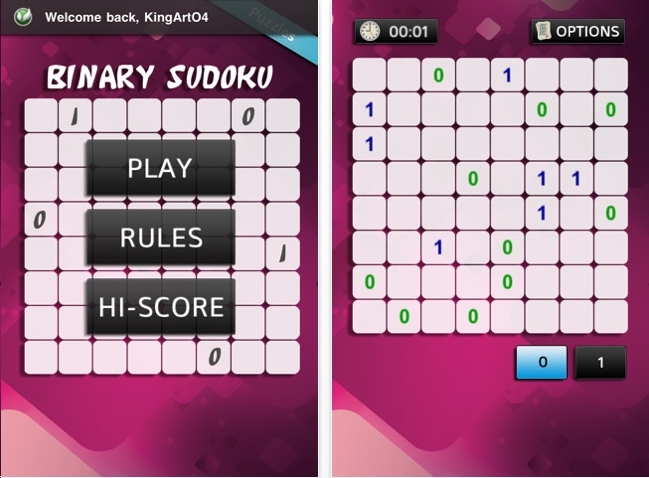 Definitely a nice change of pace from regular sudoku. 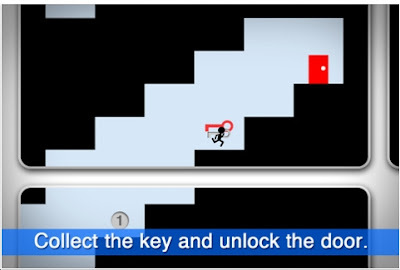 A while ago I reviewed a game/puzzle app called Drop 7. Amir Michail contacted me recently about his 2 versions of that called DropZap and DropZap 2. The object is to remove the balls before they rise to the top. Sort of like tetris, but there is no time factor. To get balls to disappear, they must shrink down one size at a time. Also, you'll see chain reactions happening with a laser-like effect & mirrors. Give it a test run! About 2 months ago Glenn Iba sent me a promo code to play-test Monorail. Terrific stuff. Then I forgot about it. Now the real version is available. So I downloaded it. 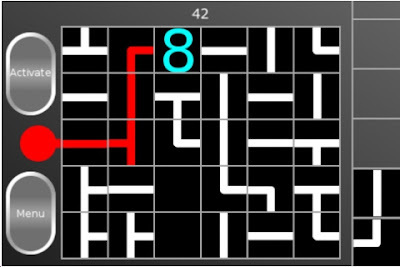 My progress on the puzzles from the demo version - gone. But it's okay, because I spent about 2 hours doing these puzzles. There are 220 puzzles: yesterday I did about 100. The easy ones are fun! The hard ones are hard! Oh yeah: the objective to to form one enclosed loop. Each dot must be connect to exactly 2 other dots. What I especially like is that some lines are given: they are gray. The lines you draw are blue. Monorail is truly addictive and more importantly fun. Right now Monorail is free. Monorail was designed by Glenn Iba and Aaron Iba. Bravo guys! Puzzle Friends: you may have noticed that I've slowed down on posting reviews of puzzle apps. The truth of the matter: I've become a little too obsessed with Mortal Coil. I've solved 161 levels and have risen to #14 on the Leaderboard. Usually, when I start a puzzle I disable that functionality: who cares? But now, I care. My goal is to rise to position #13 by the end of the week. It's a silly endeavor. But this could be inscribed on my tombstone! Head Spin has come out in more than one version. Simple concept: align the heads to be right up by shifting rows & columns. Tricky! Parking ManiaS: puzzle app plagarism? 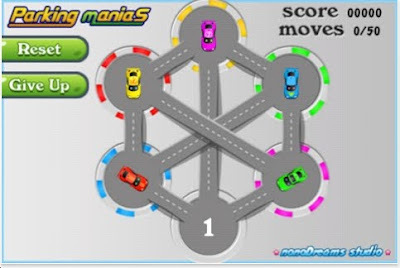 Parking ManiaS looks very similar to ThinkFun's Leapin' Lizards. Very suspicious. "Synchrony is a puzzle game involving time-travel. As the protagonist, you have to travel backwards in time and work with past (and future) versions of your self in order to solve each level. In each level, your objective is to reach the red flag. You're given a fixed number of time capsules that allow you to go back in time to the beginning of the level, where you can see all your past selves in action. You will have to work together with your past selves and manipulate objects in the level like switches and platforms in order to reach your goal. 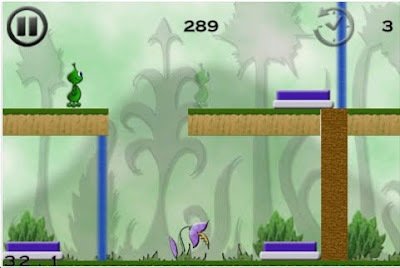 Each level is progressively more difficult and introduces new concepts to be used. The levels also have additional milestones to be achieved that require a greater degree of planning, thought and skill. Your ability to achieve these milestones determines your rating in each level." 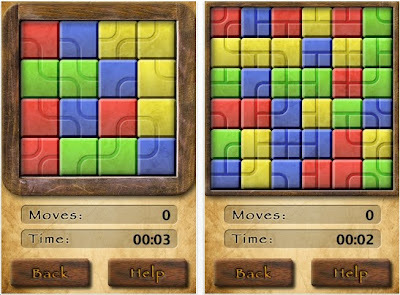 Without a doubt there is no puzzle game like this. 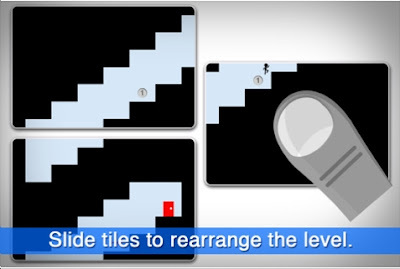 I have played & solved about 10 levels. Very interesting and strange. Definitely give it a try. There is a lite version to sample. Give it a go! Lab Mice Puzzles: Award Winner! The very wise judges at Parents' Choice have awarded Lab Mice Puzzles from Mindware.com a Silver Honor. This humble Mechanical Puzzle Correspondent for Games Magazine is the author of those Lab Mice Puzzles. The fan mail from mothers & kids have been pouring in.